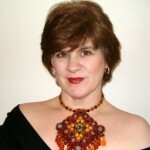 Welcome to Rhonda Guy.com a website dedicated primarily to sharing my passion for beadwork, dollhouses / miniatures, and polymer clay to like-minded enthusiasts. Amongst these pages, you will find a photographic and narrative journey featuring many of my own creations, as well as my own favorite links to websites that I particularly enjoy and think that you will as well..
Over the years, I have created a huge body of work in these categories, and cannot possibly include all of it on this site. I have, however, tried to provide examples in as wide a range as possible, and I believe it is a fair representation of what I have done. I have received many requests for additional information and photos featuring my dollhouse collection . Within the “dollhouse” section, you will find each featured house with a brief history and many (previously) unpublished photos. Just for fun, I have included a “miscellaneous” section of other things that I enjoy. You just never know what might show up there! There is also a section dedicated to “Travel Logs” of places that I have visited. I don’t get to travel as much as I would like, but when I do go somewhere, I always have a great time and take lots of pictures to share with others. Enjoy your visit, and be sure to come by often, as I’ll be adding things all the time! Also, I would appreciate it if you would take the time to sign my guest book . . . I appreciate hearing from my visitors!